With the world’s fashion press descending on New York this week, Home Arty Home kicks off #FashionFriday with a look at stylish art prints. The Spring/Summer 2015 shows hit the catwalk in Manhattan yesterday, with London, Milan, and Paris to follow, so the time is right to feature art prints inspired by supermodels, past and present. Ideal for a gallery wall in a bedroom or dressing area, these prints add a pop of effortless glamour. HOME ARTY HOME aims to spotlight great accessible art that would brighten up any home, as well as accessories and homewares that have been given an artistic treatment. 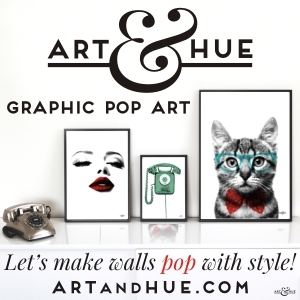 Hold the phone, it’s Joan Collins pop art by Art & Hue! Copyright © 2014-2019 Home Arty Home - All rights reserved.